Whales were hunted as a source of high-grade oil. Even when they were washed up on local beaches in prehistoric times they were regarded as a wonderful bounty of raw materials. Artefacts made from whale bones have been found at archaeological sites in Orkney and representations of whales were found in caves in Norway. Their oil was used for lubrication before the discovery of petroleum based products. It also burned to light city streets before the introduction of gas. It was a very valuable commodity. The other material, even more valuable than the oil, was whalebone. Whalebone or baleen, as it is often known are plates of horn-like material that hang down from the roof of the mouth cavity. The whale uses them to filter its food from the water. This product was used to make bristles for brushes and umbrella ribs. However it is most often associated with ladies foundation garments or corsets. 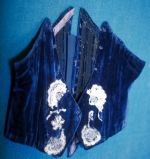 The springy nature of the bone helped some women to achieve the 18-inch waist required by the fashion of the time. Some of the whale fishermen also made bone carvings in their spare time. With declining whale populations and Dundee being the only source of this material by the end of the 19th century the price rose from £600 to £2,500 per ton. The whale to produce the most oil and the longest baleen was the Greenland right whale or bo'head. Often referred to as the black whale by the whalers, it was a slow swimmer that could be captured by a small rowing boat.